French FM says ‘we must do something’ after meeting Netanyahu and Abbas, rejecting Netanyahu’s criticism of bias seen in UNESCO. Visiting French Foreign Minister Jean-Marc Ayrault met with Prime Minister Binyamin Netanyahu on Sunday, and indicated that despite Israel rejecting the French initiative to force peace talks on it and the Palestinian Authority (PA), that initiative will advance regardless. 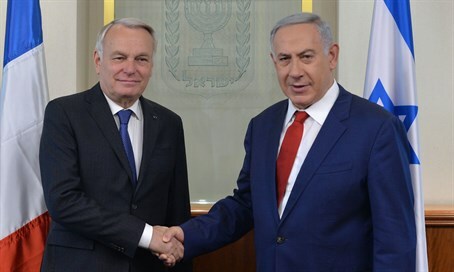 After meeting with Netanyahu, Ayrault rejected Netanyahu’s comments casting doubt on the impartiality of the French initiative, given France’s recent support for a UNESCO resolution denying the Jewish connection to the Temple Mount – the holiest site in Judaism. “France has no vested interest, but is deeply convinced that if we don’t want to let the ideas of the Islamic State group prosper in this region, we must do something,” Ayrault told reporters at the airport after meetings with Netanyahu and PA Chairman Mahmoud Abbas. Netanyahu for his part said after the meeting on Sunday that France’s support for the highly anti-Israeli and ahistoric UNESCO resolution undermined its claims of impartiality in its peace initiative. “I told him that the scandalous resolution accepted at UNESCO with France’s support, that does not recognize the bond of thousands of years between the Jewish people and the Temple Mount, casts a shadow over the impartiality of the entire forum France is trying to convene,” Netanyahu told the weekly cabinet meeting after his talks with Ayrault. The resolution referred to the Mount only as Al-Aqsa Mosque, and likewise renamed the Western Wall (Kotel) as the Al-Buraq Wall, a term from the 1920s when the Arabs began trying to claim ownership over the ancient site. Sources close to Ayrault said on Sunday that France “regretted” the resolution, echoing remarks by French Prime Minister Manuel Valls who on Wednesday called it “clumsy” and “unfortunate” and said it should have been avoided. Ayrault, who also had talks Sunday in Ramallah with Abbas later in the day, was on a visit to prepare for a May 30 international ministerial meeting to try to revive peace talks that have been frozen since the PA torpedoed a US-brokered initiative in April 2014 by signing a unity deal with Hamas. Israeli and Palestinian representatives were not invited to the French peace meeting, and on Sunday Netanyahu reiterated his opposition to indirect peace attempts, blaming the Palestinians for refusing direct talks. “I told him that the only way to advance true peace between us and the Palestinians is through direct talks, without preconditions,” he said of his meeting with Ayrault. “Any other attempt just distances peace and gives Palestinians a means of evading dealing with the root of the conflict, which is not recognizing the State of Israel,” he said. “They’re simply avoiding negotiating with us,” Netanyahu said of the Palestinians. Sources in Ayrault’s entourage said Sunday the French peace initiative was not aimed at “preventing or bypassing” direct talks between the parties, which Paris believes is the only way to resolve the conflict. “The problem is there are currently no negotiations,” the sources said. PA foreign minister Riad al-Malki said to reporters after Ayrault’s meeting with Abbas that unlike the Israelis, they welcomed the French initiative. “We wish France and its efforts success because the French efforts are the only ones on the ground now, and could eventually result in giving the political process a good push forward at this stage,” he said. The French initiative calls to relaunch peace talks based on the 2002 Saudi peace plans, which would have Israel make massive concessions in exchange for paper promises not to attack from its Arab neighbors. Not only has Israel rejected the new French push, but the US likewise has been reluctant to support the move. In what many Israelis consider to be misplaced concern, the French are working to put together a summit on the Israeli-Palestinian issue – without the Israelis or Palestinians – and will likely push Israel toward concessions that would threaten the national and security interests of the Jewish State. The French foreign minister has confirmed that Paris will host an international meeting on May 30 to try to restart peace efforts between Palestinians and Israel — even though both sides will be absent. Jean-Marc Ayrault said on Friday Arab nations will be among the 20 countries present, but “for the moment there is no dialogue” between Israel and the Palestinians. France has pushed to play a larger role in Middle East peace efforts, dominated by the United States. The Palestinians said Thursday they strongly support the French initiative. Palestinian Foreign Minister Riad Malki, who has openlydeclared the Palestinians will never negotiate directly with Israel, said Palestinian and French leaders agreed during meetings in Paris a few days ago that the French initiative should move ahead and not be jeopardized “in any way” by Palestinian efforts to get the UN Security Council to adopt a resolution that would condemn Israeli settlements as an obstacle to peace. He said the draft resolution has been given to Arab ambassadors and an Arab ministerial committee will be meeting very soon to decide when to give “the green light” to circulate the draft resolution to the 15 council members.